My experience with designing and manufacturing a product, as you might expect, has to do with planners. 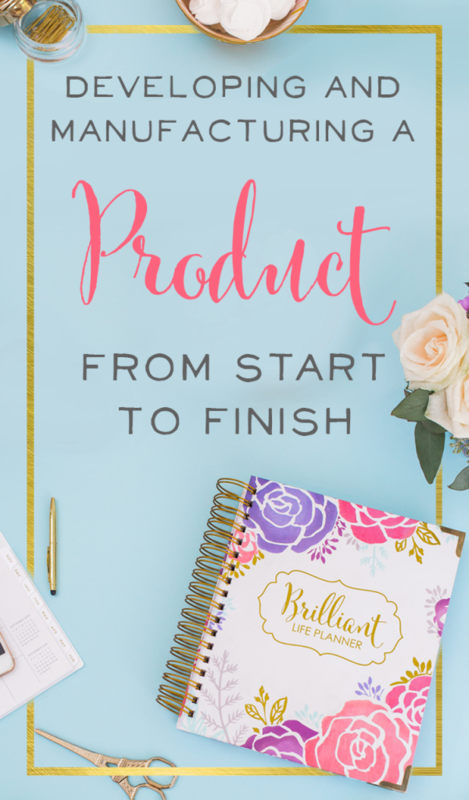 My product started originally as the Brilliant Business Planner which launched in June 2015. That first iteration morphed to the Brilliant Life Planner, which launched via Kickstarter in August 2016. I’ll take you through this process. And rest assured the takeaways will apply to you regardless of your niche. If you have a fabulous idea for a product that you just know is going to improve people’s lives, and you know it’s a better product than what’s on the market currently, JUST GO FOR IT! Yes, there are a lot of steps and unknowns, and you’ll learn a lot along the way, but you’ll be so glad you did it. When you’ve produced a fabulous product that you can put into people’s hands to help them, it’s really an incredible feeling. That’s my pep talk as we get started. I’m going to share my journey and the big takeaways you can keep in mind for your own product launch. 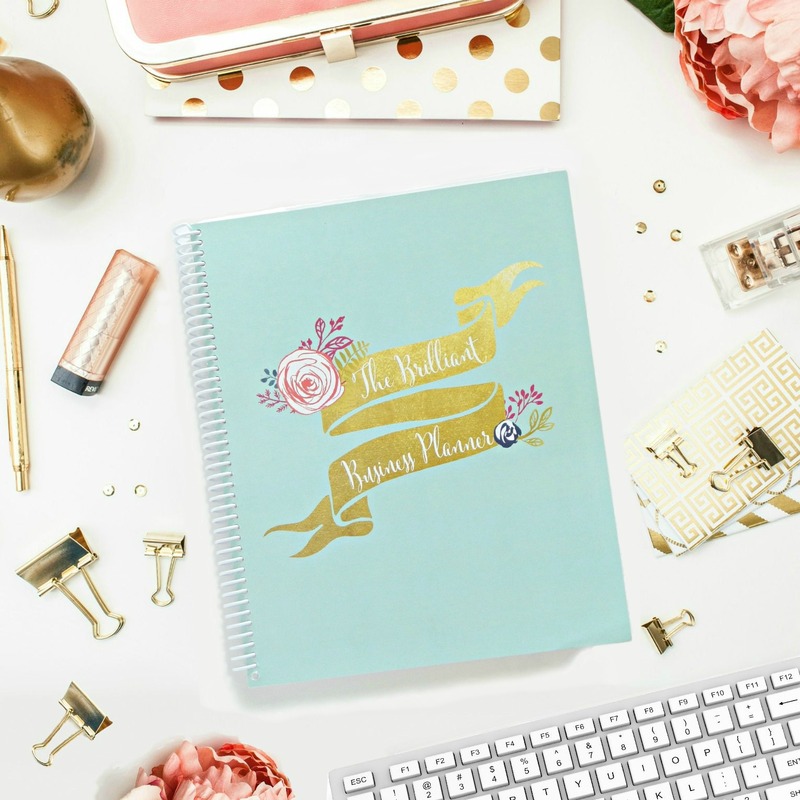 As my sister and I were writing our book Time Management Mama, we wanted a planner that allowed us to plan our business and lives in one place. Our planner idea started with lined, blank paper. We sketched out what we wanted on those pages. We really wanted work and personal to-do lists and a place for our top 3 priorities for each week. Plus we knew we wanted our weekly layout to be time blocked. We just sketched it out our ideas. I should go pull up our old sketches for fun! Neither my sister or I are very artistic or good at drawing. These early sketches were SUPER rough. We knew what the end result should be, but we needed help bringing it to life. From there, we found a designer to take our sketches and turn them into a digital file. Takeaway: Those of you trying to produce a totally unique physical product will eventually need a CAD file. CAD stands for Computer Aided Design. You’ll need an expert to translate your ideas to this digital format so that your manufacturer can use and produce your product in mass quantities! Takeaway: When you find your designer, one of the best things you can do is be really prompt with feedback. The Design and Development Phase takes a lot of time. It’ll take way more back and forth than you imagined. If you want to keep your project moving forward, you need to write back to that person within 24 hours every time. Otherwise, you’ll be the kink in your own system. Then a year will go by without having a product, but it’s because you didn’t give prompt feedback! Since this time, we’ve worked with a few different designers and they all appreciate the feedback. They’re in creation mode and ready to work, you just have to give the direction you want to go. If you’re fortunate enough to have a designer reach out to you and ask you to hire them, you can always go to a site like Upwork.com and submit your job. You’ll give details about the job you need to have done and the hourly rate you’re willing to pay. I have to say, I’m not a huge fan of paying by the project. I know a lot of graphic designers have project fees – something like $1,500 for one project! I don’t like that at all!!! Here’s why. I want to build my working relationship with a designer and start with a few hours of work before I commit to using them exclusively. Sure, design portfolios are great. But I don’t know how well we’ll work together until I give the designer a few hours of work and we have some back and forth. How responsive will they be? How quickly do they make the changes I request? How easily do they understand my feedback? Maybe someone who’s skilled just can’t get your vision. Or maybe you two will have a language barrier that can be tricky. You need to cut ties before the project goes too far! Again, I don’t want to pay $1,500 if it took someone 5 hours to do the work! Or $1,500 if it took a couple hundred hours and I should pay them more. It’s ideal to have a designer who is versed in both Adobe Indesign and Adobe Illustrator. (Currently, I do have two designers — one to make my signature florals pretty in Illustrator and one to format the planner in InDesign. They’re both wonderful ladies I enjoy working with!) And, as I said earlier, if you’re creating a physical product you’ll need CAD files. It's so important that you take a look at the marketplace and study other similar products on the market – then know how your product will set itself apart, and the specific void it fills. For example, when we were working on our first planner I purchased 20 different business and personal planners. I bought as many different ones as I could find with different covers and layouts. I wanted to be an expert in the marketplace. What are the issues and needs these products are not addressing? What do these planners do well? I knew after the first iteration of my planner that I wanted a hardcover. This is an example of a feature other planners had that we didn’t. Sure, at the end of the day a planner is a planner, but there are many little features you can customize to reach your audience. The void your business ends up filling may not be huge, but you don’t want to go through tons of time and effort to create something already existing. Knowing the specific void that you want to fill not only will steer your business development, it will help you with marketing later on. I see some people who don’t want to look at what others are doing in their niche; they think, “I’m just going to create from my brain and it’s going to be totally unique.” While I do understand that point of view, I have experienced that you miss things by not knowing what’s out there. It’s your job to be an expert in your space. When it comes to getting your product produced at the most affordable price, you will likely have to look at an overseas option. The Brilliant Life Planner is currently manufactured by a factory in China. One hurdle with using a factory overseas is they often have pretty high minimum quantities you need to order before they’ll take an order from you. Produce your minimum viable product, knowing there are several improvements you will make over the next years. Take presales for your product. Once you have one product sample or prototype, get some photos and offer people a sample of what they’ll get. You can take presales with an expected production date in mind. We gave them our design file and they produced a sample planner for us. Actually, our first sample planner had a white cover, which we realized would get dirty and scratched so quickly, so one immediate change we made was to make our cover a lovely shade of bluish-green. Our printer could accept a minimum order quantity of 100 units. Voila! We had our Minimum Viable Product. Keep in mind that factories will generally want you to order 1,000 units. Even with that smaller order quantity, our minimum viable product still cost us several thousand dollars to produce. The cost-per-unit is much higher with smaller quantities and it's usually much higher with a manufacturer in the United States. By going overseas to manufacture the new Brilliant Life Planner, everything on my dream sheet – product gift box, custom shipping, full color, thick monthly dividers, metal corner reinforcements — was the same price as my minimum cost-per-unit in the United States. I still don’t recommend coming up with an idea and plunking down thousands of dollars right away! If we went overseas for our first planner order, and we had to order a thousand units, it would have cost at least $10,000 — and that would not have been a wise business move. Takeaway: You want to validate that people want your product, before spending tons of money to create the product. Use the Minimum Viable Product Strategy or take Presales. Once we brought our first Brilliant Business Planner to market, we were able to make sales — and I’ll be honest, those first sales weren’t great. But the women who bought this planner loved it and used it every day. We chalked up the slow sales to not launching in the right season (we launched in June) and with a half-year planner. Then we tried a run of the planner closer to planner season with a full-year planner and sold 300 units. That felt great for us! Using the strategy of a minimum viable product will allow you to start with small, manageable steps — and then tweak your way to success. We sent out a customer survey shortly after our product first launched and asked if there was anything at all our customers would want to be changed. People loved our florals and the planner in general, but not everyone had a business, so they did not need all the sheets. They wanted the time blocking pages, notes pages, goal-setting pages and project pages, but not the pages dedicated to growing a business. I thought I could serve a lot more women if I made the planner for any woman who wants to live intentionally. And that’s really how the Brilliant Life Planner started. Around this time, Sarah stepped away from the Brilliant Business Moms brand, so it was on my shoulders to get the new planner design in place. But this time it was much easier because I had a base of design files that I could easily tweak and improve and remove those business specific sheets. I also knew I wanted a much smaller planner and a hardcover planner, and I knew our local printer couldn’t accommodate these needs, so that made me explore other options for manufacturing. It’s so true! I feel like a lot of business owners out there want all the answers before they’re ready to get started. I’ll be honest, you’ll never have all the answers. There was a moment in creating the Brilliant Life Planner when I literally had this amazing product – 1,600 planners on a boat ready to come to me – and I didn’t know how to get them to clear customs. I didn’t know what to do! Takeaway: Everything is figureoutable. You can find the answers you need! To find my factory I visited Alibaba.com. On this website, you can find factories from all over the world who show you the products they’re experts at producing. I searched keywords like: ‘planner’, ‘weekly planner’, and ‘hardcover planner.' I found a factory and I was able to see that the structures of the planners they produced were really similar to what I wanted. The factory quickly sent back photos of other planners that they had produced, which gave me the confidence that they could print my planner. When it comes to working with a factory, keep in mind that you never ever, EVER want to throw down cash and order 1,000 units and wash your hands. Takeaway: Always order a sample first. You need the proof in your hands that this factory can produce the quality you’re looking for. You have to order a sample to see if any tweaks need to be made. You may need to order another round of samples. You want to ensure that the end result is just what you want. The factory shipped the four units pretty quickly since we didn’t have to clear customs with the small quantity, so I got my samples within a week. After looking at these samples, I realized there were tweaks that needed to be made and corrections to the files. There were two covers I loved, and two I didn’t, so I came up with new covers to try. I requested the changes and ordered four more samples. With this additional round of samples, I also included a gift box and card with each planner. Once I had these final touches in place and was confident the factory could produce what I wanted, I picked my four favorite covers and we were in business! Since I only sold 300 units of my first planner, it felt like a risk to not use presales as a way to test the market for the Brilliant Life Planner. We used Kickstarter, but I have to be honest, I was not a huge fan of running a Kickstarter campaign. I found the whole process irritating, exhausting, and expensive. If I ever would take presales again, I would put the product in my Shopify store and explain that it’s available for presale, giving people the expected shipping date. You think you’re being smart to take presales before ordering in mass quantities. And while it is smart, you can easily spend $10,000 getting a Kickstarter off the ground, especially if you hire a photographer, videographer, graphics, and so on. Honestly, I’d rather see more people do minimum viable products. You could set up an online store with listings (you will need it to sell the product anyway), hire a photographer for an hour or two to get product photos, and go from there. Let me just tell you, it takes much longer than you’d expect for your product to be manufactured, shipped, clear customs, and get into your hands. If you’re using any factory outside the US, give yourself 3 months for the product to get to you — or to your fulfillment center. I was pretty lucky with how the Brilliant Life Planner shipping worked out. I ordered 1,600 units in mid-October and was able to get them to my house by mid-December. To get this 2-month turnaround there were many things that worked out in my favor, but I wouldn’t expect this kind of magic to happen every time! Give yourself at least a 3-month margin for sure. One way you can help this process along is to communicate constantly with your factory. In my case, the factory I worked with told me they needed a 50% deposit for materials and paying employees, and then the other 50% was required to get the planners on the boat and shipped to me. They told me it would take a month for my 1,600 units to be manufactured, and another good month for shipping and clearing of customs. Before we talk about what it’s like to get a product through customs — which was a huge learning curve — I did want to point out one other thing. If you’re having trouble finding a factory producing to your standards, here’s a pointer: You can look up import and export records from other companies in the US, as that information is part of the public record. If there’s another company who also produces a product in your niche — a high-quality leather shoe, for example — you can find out which factory that particular company used. Maybe you find another company with a similar, high-quality leather show, or even just another shoe company. You could search ‘TOMS import records’ or something like that. You will likely find a factory that could work with you on your shoe design if you search around. Here’s how you do it: Google search ‘import records (company name)’ for whatever company you’re searching. Be aware that the company's official name may be different than how their name presents. You can find Bill of Lading information from many companies using ImportGenius.com. Every shipment into the United States will have a bill of lading, and on that document, you can see the name of the factory. Import Genius does cost some money, so you may want to try other free resources first, but if you can’t find what you’re looking for, Import Genius may solve the mystery. For a lot of products, it’s a safe bet that they’re produced in China. You could use a one-country plan, select ‘China,’ and see what you can figure out. TradeAtlas.com has the bill of lading records also. And I was able to get a good amount of details using their free options. Takeaway: This will take some detective work, but using Google and possibly a few additional Internet resources you should be able to figure things out! After you’ve taken presales (if you’re choosing that route) and have 50% to plunk down to the factory, the next step is to focus on shipping and getting your products cleared by customs. Any big shipment into the US will need to be cleared by customs. And I’ll be honest, I’m still very confused by this process. I searched ‘customs broker San Diego' and ‘customs broker Los Angeles.' From my paperwork, I could see that initially my shipment was arriving in Los Angeles, but then would be transported closer to me in San Diego. Obviously, when it comes to working with factories overseas communication isn’t going to be as constant. But when it comes to working with people who are state-based like customs brokers and freight forwarders, it’s much easier to just pick up the phone and call them. (I did find that a lot of these places are very unresponsive to email.) I called up the first company I found, and got an answer, “We don’t do that, but try this company.” And then I got the same thing again with that second company! But finally, the third company was able to help me out. Takeaway: Pick up the Phone! Though it was a winding way to find my broker, as soon as you find a great customs broker, they’ll know exactly what you need. So my broker was able to quickly come back and say, “Hey, here’s some additional information and a piece of paper I need from your factory.” And you say, “Great, let me get that for you!” Hopefully, your factory is really responsive and you can put that information into the hands of your customs broker. In my case, my planners had already left their port and another week went by before I found a broker to help get our products through customs. It was not the best timing, for sure, but thankfully she was able to jump to action and we got the planners to port. My factory already had a company they worked with lined up to take their shipments off the boat and put them in a warehouse. I didn’t have control over that step, so I had to wait while these steps happened. It took about a week for the shipment to get unloaded off the boat, and then finally the company could give me the status of the order. At this point, I needed to present paperwork to prove my shipment had cleared customs and my freight forwarder could get the planners. At the end of the day, my customs broker dealt with all these nitty gritty details. (And I was so grateful for her expertise and her quick results!) It was less than $2,000 for the customs broker plus freight forwarder. You need to add that into your cost per unit! We did end up getting our own truck and not waiting for the freight forwarder to bring the planners to me. We called the warehouse and asked if we could come get the planners; they worked with us and told us the specifications of the truck we’d need — and we got those planners! But if we had given ourselves that extra month margin, we wouldn’t have had to mess around with all of that. Takeaway: Find a really good customs broker who has lots of experience dealing with the port where your products will dock. You do not have to figure this out all on your own! I promise, with the right help you won’t be stuck in some warehouse in Compton saying ‘let my products out!’ (Not that I know who that person would be!) Bottom line: get someone on your side who can help you. How do you go about finding a fulfillment center? You guessed it, Google it! Search around and call a few up. Give them your unit numbers, your specifications, and what you need them to do with the orders. Ask for their cost to store and fill those orders, and then compare statistics from a few different centers. Not to mention, when you call up the center you’ll get a sense of the company and how professional they are, what their communication is like, and how organized they seem. Find an awesome, quality designer who’s skilled with Illustrator and InDesign if you’re manufacturing something like a planner or journal, and CAD if you’re making a different kind of physical product. Make sure you are responsive and give fast feedback. Find a customs broker for the largest port near you. And ask your factory where they would send your shipment. Give them the final address of your product, either your house or fulfillment center, and they’ll tell you how to get your shipment. Pick up the phone to communicate with the key players in this process! Use Google! Be a detective. And take deep breaths along the way. Ask around and you’ll always find someone with the missing link you need to keep your project moving forward. Start with a minimum viable product. You may want to work with a US-based company first and produce a tiny run or take presales for your larger overseas factory order.